A Cheap Washington DC Weekend? Here's How! Looking for a Cheap Washington DC Visit? "Mom, can we visit Washington DC and see the sights?" When my kids asked me this a few months ago, I though "Why not?" 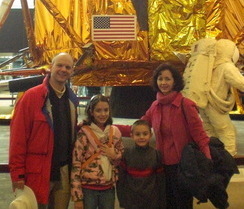 After all, we live within a few hours drive of our nation's capitol, and we hadn't been there for a few years. So I took it as a personal challenge to see if I could plan a 3-day weekend for four for about $500. My goal was for it to include lodging, food, parking, and admission to enough sights to keep our family happily entertained all three days. Was I successful? You bet. In fact, we managed to do it for about $500 for FIVE people, not four. "Hmm," says Aunt Cindy. "Should I lift the lid off the Capitol and see what Congress is doing? First, the best way to save money on a trip to Washington DC is to visit off-season. And the most "off-season" month is February. If you don't mind having to wear your winter woolies, February is the "deadest" month to visit the city. Relatively speaking, you'll have the city to yourself. And because the tourists are so few, you'll be able to get an amazing hotel deal like I did! I knew that I wanted a hotel which was close to the action, so we wouldn't have to buy Metro passes to get around. Add to that the fact that my husband has a frequent stay card at Holiday Inn, and that Holiday Inn lets kids 12 and under eat free, and the choice was easy. Holiday Inn, it was--specifically, the Washington-Capitol Holiday Inn. At about 1-1/2 blocks from the Smithsonian's Air & Space Museum and the National Mall of Washington DC, I don't think this location can be beat! 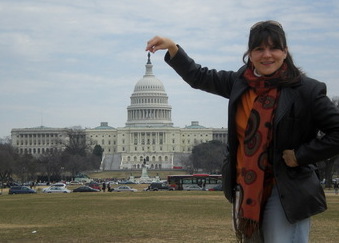 OK, so this tricky shot of the Washington DC Capitol Building wasn't quite as successful...but still fun! I initially booked a room through Hotels.com for $130 per night (not including tax, parking, and a roll-away bed for Aunt Cindy, who joined us). However, digging a little deeper, I found an even better deal through the Northwest Airlines website, www.nwa.com. It was a "Book One Night, Get the Second Night Half Off" deal. So I got TWO nights for $185! (Again, not included taxes, etc.) So it pays to check around. And that was our only experience having to wait in line the whole weekend! Looking for other cheap travel ideas in Virginia? Click here for our Cheap Family Vacation deals! 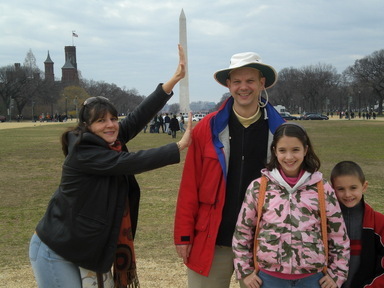 Splurge for reserved tickets for the Washington Monument tour. They're worth it! One of the best ways to plan a cheap Washington DC weekend is to take advantage of the free sights. The Smithsonian alone has a total of 17 world-class museums which are totally free (with one slight exception--see below). Plus, there are numerous government sights--like the National Archives, the Bureau of Engraving and Printing, the White House tour, the Capitol Building, the Library of Congress, and the Washington Monument-- which are free as well. Visiting them could easily keep you busy for a week! Actually, we only spent about $20 total (for five people) in admission-related fees the whole weekend in Washington DC. Twelve dollars was for parking at the Dulles Airport branch of the National Air & Space Museum (no way around that, I'm afraid). I also chose to splurge $1.50 per person to get reserved tickets for the Washington Monument. Looking for other cheap travel ideas in Virginia? 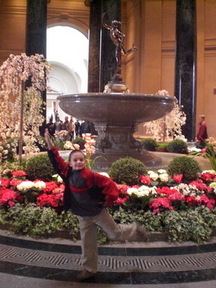 The fountain at the National Gallery of Art. Click here to learn why this may be the best $1.50 you'll spend in the city, plus learn what they WON'T tell you on the Washington Monument tour! If you're interested in space, aircraft, or just like pushing buttons, be sure to read our detailed review of the National Air & Space Museum. If you're a history buff, and/or have an interest in the military, run--don't walk-- to the amazing Marine Corps Museum in Triangle, about 30 minutes south of DC. If you want to feel like you're in Europe, check out the amazing architectural details of the National Archives, and the flying buttresses, stained glass windows, moon rock, and the Darth Vader grotesque at Washington National Cathedral. And for a list of other FREE Washington DC attractions, click here. In Washington DC, you definitely pay for location, so you best way to save is to either stay outside the city, OR snag a great deal on a local hotel (more on that in a minute). Our favorite place to stay? The Washington-Capitol Holiday Inn. At about 1-1/2 blocks from the Smithsonian's Air & Space Museum and the National Mall, the location of the Washington-Capitol Holiday Inn is superb. We were within a short walk of everything we wanted to see in Washington DC...5 minutes from the National Mall, 7 minutes from the National Gallery of Art, 9 from the Natural History Museum, and 10 from the National Archives. We even managed to walk/run to the Washington Monument within 15 minutes to make a 3:30 tour. And since a Washington DC block tends to be r-e-a-l-l-y long, that's a huge plus! The hotel itself is a typical Holiday Inn, with multiple restaurants, ample parking, and amenities. The room was comfortable, clean, and quiet (ask for Floor 4 or above), and the manager even phoned our room that evening to check on us and let us know we should ask for her if we needed anything. Nice touch! Food at the restaurants was good (with ample portions), a good choice of kids meals (remember, they're free for kids 12 and under), and the staff were friendly and helpful. If you're really pinching pennies on your Washington DC weekend, you could save more by eating at the McDonald's or the Quiznos on the same block, or taking advantage of the in-room refrigerator and buying cereal and milk or snacks at the CVS next to the Quiznos. There's even a Starbucks on the opposite corner. Another cheap option which I decided not to pursue for our Washington DC weekend was to stay at Hotel Harrington. This family-run hotel, located three blocks from the White House, gets good marks from travelers for its location, reasonable room rates, and simple, but comfortable lodgings. I could have booked a room that slept 5 for their winter discount rate of $175 per night. Parking would have been $15 per day (less than half the cost at the Holiday Inn). My concern was that the location wasn't quite as good as the Holiday Inn's. Plus, once I added in the free meals for the kids at Holiday Inn, it easily outweighed the cheaper parking at Hotel Harrington--even if we hadn't gotten such a great rate. 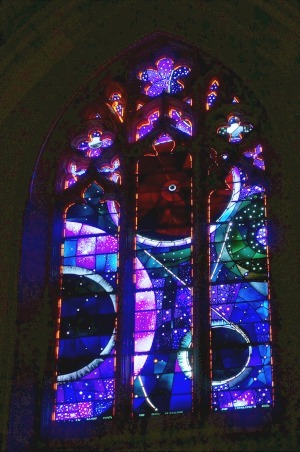 The Space Window at Washington National Cathedral has a real moon rock. One option we've tried is to stay outside the city and drive in. For example, last year we stayed at a Spring Hill Suites in Alexandria and then drove into the city. The hotel was far cheaper than we would have paid in DC, and we actually found free parking right in front of the Newseum (Tip: Street parking is free-- and often, plentiful-- in DC on Sundays). Regardless of where you choose to stay, you can often find great deals through hotel hubs like HotelsCombined.com, or by using and app like Hotel Tonight.